Rockcliff Identifies Multiple Untested Airborne Targets and a Thick Graphite Zone on the Penex Property — Rockcliff Metals Corp.
Toronto, ON – March 29, 2018 – Rockcliff Metals Corporation (“Rockcliff” or the “Company”) (TSX.V: RCLF) (FRANKFURT: RO0, WKN: A2H60G) is pleased to announce that it has identified on its Penex Property a series of untested airborne electromagnetic (EM) conductive anomalies over a strike length of 2.6 km located near a historical drill hole (C-9) that intersected 67 metres of near solid graphite. The Penex Property also hosts, at approximately 350 metres vertical, the down-dip continuation of the historical Pen Zinc Deposit. Rockcliff’s 100%-owned Penex Property is strategically located within the prolific Flin Flon-Snow Lake greenstone belt within 5 km of Hudbay’s Lalor Volcanogenic Massive Sulphide (VMS) Mine and within trucking distance to an operating base-metal mill. Graphite remains the dominant material used in lithium-ion batteries. According to Benchmark Mineral Intelligence, demand for graphite is set to “increase by over 200% in the next four years as global cell production surges on the back of maturing pure electric vehicle demand and the inception of the utility storage market”. 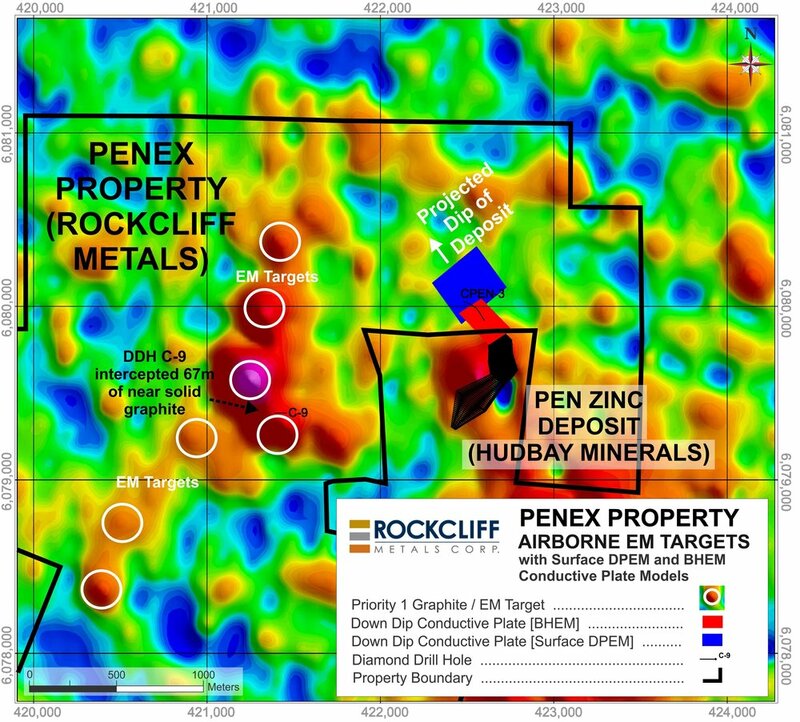 The plan view map outlined below highlights the location of drill hole C-9, multiple untested airborne conductive EM anomalies and the projected down dip extension of the Pen zinc deposit. The longitudinal section map below outlines the location of Hudbay’s Pen zinc deposit at surface and its down dip extension where the deposit dips onto Rockcliff’s ground at an approximate vertical depth of 350 metres. A single historical drill hole CPEN-03 intersected the Pen zinc deposit at a vertical depth of 475 metres and graded 4.04% Zinc Equivalent across 7.57 metres. Rockcliff’s DPEM surface electromagnetic survey (see Press Release dated March 21, 2017) identified that the down dip conductive plate continues to at least 800 metres vertical and increases in conductivity with depth. The Company is a Canadian resource exploration company focused on the discovery, advancement and consolidation of a portfolio of some of the highest-grade, undeveloped metal deposits in the prolific Flin Flon – Snow Lake greenstone belt located in central Manitoba. The Company’s current portfolio of properties, totalling in excess of 45,000 hectares, is located in and around the 100 year old operating Snow Lake Mining Camp and hosts NI 43-101 compliant copper deposits (the gold-rich Talbot Copper Deposit and the Rail Copper deposit) and undeveloped historical zinc deposits (the Lon zinc Deposit, the Bur Zinc Deposit, the Morgan Zinc Deposit and the down-dip continuation of the Pen Zinc Deposit). The Company’s properties also include Manitoba’s first and highest-grade former lode-gold producer (Laguna Gold Property), four additional gold-rich properties (SLG Gold Property, DSN Gold Property, Berry Creek Gold Property and Lucky Jack Gold Property), a Net Smelter Royalty on the Tower Property slated for production in 2019-20 (the T-1 Copper Deposit) and the optioned near-surface high-grade MacBride Zinc Deposit located north of Snow Lake near Leaf Rapids, Manitoba.